At this time of year pets are out and about with us and may be more likely to get themselves into tricky situations where they need our help to give first aid before getting to a vet. 1. Heatstroke - Put the dog somewhere cool with a draught out of direct sunlight. 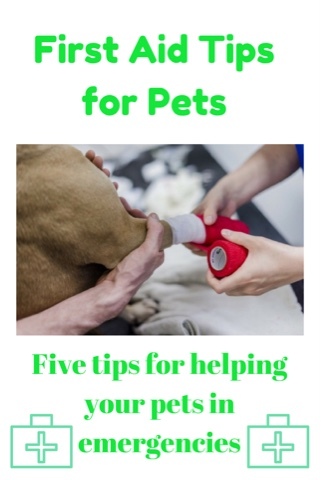 Wet the coat with tepid/cool water (not cold water) and go the vet. You can offer a small amount of water but don’t delay going to the vet. 2. Cuts and bleeds – Most cuts are best left undressed, but if there is continued bleeding a bandage maybe needed. 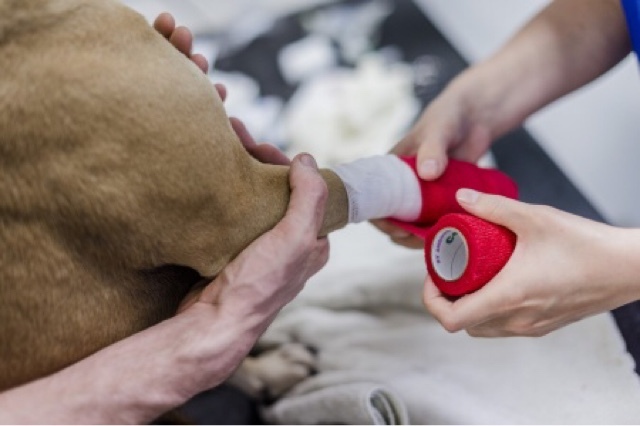 To put a bandage on you must apply a layer that won’t stick to the wound such as a clean towel or cloth, add a layer of padding such as cotton wool to protect the wound, secure in place with a bandage that isn’t too tight and get to a vet as soon as possible. 3. Poisoning - Some of the common symptoms of poisoning are staggering; vomiting; dribbling; collapsing; and difficulty breathing. Call the vet immediately. Take any packaging or plant cuttings with you to the vet. Do not make your pet vomit unless your vet tells you to do so. Rabbits do not have the capability to vomit. 4. Coat contamination – Use an Elizabethan collar, if you have one, to prevent them from licking it. For smaller animals and rabbits, wrap them in a towel to stop them from getting to the affected area. Never use turpentine or paint remover on your pet. Contact the vet. 5. Stings - Pull out the sting if possible by pressing below the poison sac. Soothe with ice and contact the vet for advice. Watch the animal carefully because if the sting is in the mouth or throat, it may swell and interfere with breathing.